PCH I WOULD LOVE TO WIN 5,00,00 A WEEK FOREVER 3080, 4900 I WANT TO WIN!!!!!!!!!!!!!!!!!!!!!!!!!!!!!!!!!!!!!!!!!!!!!!!!!!!!!!!!!!!!!!!!!!!!!!!!!!!!!!!!!!!!!!!!!!!!!!!!!!!!!!!!!! Today I was just sitting on my porch wondering if I can be so fortune to win would I be able to come out of financial debt. Can I take my family on a vacant that they would be happy to go after all they have been helping me through all my sickness . I ready would like to see my dream come true. I would love to win. my children and I really need it. I would love to win this forever prize to help my Mother fight breast cancer and to give my two daughters the best education. Thanks so much PCH!!! Hope to see you soon. I want to win on Abril 30th!. $7,000.00. A Week from PCH Gwy. 4900.and $5,000.00. St Patrick’s CASH PRIZE. from PCH Gwy. no 5164 on March 17th! Hello PCH, I watch and see all the families you’ve helped throughout the years and I just want to say, when I see the excitement from the families I cry with them because it’s such a beautiful thing to happen to people, the needs are genuine and often desperate and like the cavalry your right on time, God bless you all keep up the awesome work, I use to think I was just a gimmick but I see its real. I hope and pray to win the 7 thousand a week for life. I have helped others and with this I could finally help my son.. new boyfriend and myself by buying a new home and open a business. I need something I can leave for my son. We plan to have a baby at the end of the year and this would help big time with the hospital bills and everything else needed. I am a welfare mom and my goal is to get off welfare. win me $5,000.00 an $7,000.00 a week for life an win me $1,000,000.00 yes i would just love to see pch drive down my driveway to announce me a millionaire making superprize. win me a lifetime dream come true win $5,000.00 an $7,000.00 a week for life an $1,000,000.00 win me a millionaire making superprize. PCH PLS ENTER MY ENTRIES TO WIN ON MARCH 17TH, GWY NO. 3080,3148,3577,3600,4650,4651,4749,4900,5164 THNX PAULINE…. PCH IM ENTERING $5,000.00 A WEEK FOR LIFE ON MARCH 17TH, GWY NO.5164 & WIN $7,000.00 A WEEK FOR LIFE GWY NO.4900, PLS ENTER MY ENTRIES THNX PAULINE…. PCH IM ENTERING TO WIN $7,000.00 A WEEK FOR LIFE SUPERPRIZE EVENT, ON APRIL 30TH GWY NO.4900, PLS ACTIVATE MY ENTRY THNX PAULINE…. I want to win $5,000.00 A Week Forever on March 17th 2015. I have been working very hard in searching for an opportunity to win this awesome prize that will set me and my family for life. It will help us buy a better house for my family and also help renovate the building my family serves boxes of groceries to families in our community who are without food. The renovation of the building will attract more families to come for help. My family loves helping the people in need. So, please, help us! Well today while I was in the dean the door bell ring n I got up n walk to the door n it was ups guy with a package for my daughter . Do u know how it feel to think that it’s pch van at ur door and it’s not especially when u re half a sleep. I ready want to win it would be so nice to pay off my financial debt be gone . I sure would love to win. I have never won anything in my life yet. I have playing the PCH games for over 35 years and had not won a penny from them. It is for the Rich people to win or they pay a actor to say the won. There is no way we can win. I believe it is all phony. I’m keeping my fingers cross for the drawing on April 20, 2015 to win the $7,000.00 for Life. It’s getting closes, please pick me for it. Please accept the correction of my address; for the comment just sent. yesterday after church i realize if you don’t love your self nobody else will.I believe in god and not what everybody opinion mean I trust in him.If I can win a drawing I can put all of there negatively to rest for one and all.I believe when the time is right god will let me know and I can come out of financial debt and leave a legacy behind. yes i would love to be a pch winner i really would i know that there is sopost to be a superprize delivery for $5,000.00 a week for life how ever did win shure is lucky but yes yes yes i would love to win eather $5,000.00 our $7,000.00 a week for life an maybe even $1,000,000.00 superprize winner well ill still be here waiting for that day to make all my dreams come I’m crossing my fingers an hoping to be a winner one day. Believ..ng so much by feeling the joy of winning this would bring:a life-changing experience, a warm place to live when its cold outside.Being on social security limits my husband and Iof warmth and some of the better things in life.My husband is a man of unwavering faith.This would bring tears to our eyes, joy to our hearts, hope to our life,warmer rooms to our home, and a dream for a lifetime.Keep on believing.never give up. PCH IM ENTERING THE OFFICIAL AUDIT REPORT, TO WIN $7,000.00 A WEEK FOR LIFE ON APRIL 30TH, GWY NO.4900, THNX PAULINE….. Please activate my entry for gwy #4900. SAD but FAITH conquers all that man is in control of. I hereby CLAIM my entries to WIN the Gwy.no.4900, $7,000.00 a week for life. I have entered many PCH GWY nos. to win a contest. I have received Official Notification to Win from the ANC in Kansas City to be the Winner of a CASH lump sum ($1,230,946.00) and I have not received any actual statements when and if I really won,also if the Prize Patrols will deliver to home. I have worked so hard to keep this country safe from Terriorism and Natural Disasters. I pray that life does not showa FINANCIAL DISASTER in this life.I had to borrow to keep my mortgage paid and the time has ran out with person of great religious beliefs. I pray daily for God’s BLESSINGS.I borrow to keep my phone on to play the PCH Sweepstake(s) games. Pch Board of Judges, please contact me regarding the ANC request that I send in the Offical fee for $11.89 which I borrowed. I cannot believe my time spent the computer past the age of 75 and alone with no help, I am not a WINNER with Presidential ELITE Status. I pray to GOD to let me hear of his BLESSINGS immediately. Thanks!! to selecting me as the next PCH “WINNER” for the March award for the amount shown on the ANC statement which I returned the next day by money order of $11.89. Which was 4 days ago and no response. Hope to be picked to win thank you very much . Well yesterday was the drawing I sure wish that I won this drawing for I can come out of financial debt n leave a legacy behind. But is ok some day my dream will come true n I’ m going to continue on playing n searching everyday until it happen my god bless who every won. If I do not win today then I know that it is just a matter of time before I do win a sweepstakes prize. I really want it to be pch so the world will know that I knew I was going to win this year and I’m telling you now. 02/27/2015. Amen. 1n 12 years of faithfully playing your games and i have never won anything,not a thing. Now would be a good time to win. Today is the drawing just like everybody we hoping to see the pch van in front of our door. Yesterday my car broke down the transmitting gave out I pray that it would get home . It did after it stop for serve time it’s so scared when u re sitting interstate and everybody is blow at u if I can see mr. David, mrs. Daniella , n mr. Todd at my home it would be a blessing from God for everything we have been through over the years especially with my financial n been sick. PCH IM CLAIMING MY SUPERPRIZE NO. TO WIN $5,000.00 A WEEK “FOREVER”, PRIZE, GWY NO.4900, PLS ENTER MY ENTRY THNX PAULINE…. PDH GWY # 4950 $1,000,000.00 GWY I Really Hope IGot That Too Y’all In Time “WOOHOO ” Thank You !! “A KNOCK KNOCK AT MY DOOR TOMORROW “!! I’m PRAYING THAT THE LORD ( & Y’all ) HEAR MY PRAYERS! Please help me get out of the “Situation That Myself & My Little Dogs are in? So WE CAN GO TO WHERE MY PARENTS ARE AND GIVE THEM /US A HOME! Also to help those in need, that can’t he themselves:,(( and all of the “ABUSED ANIMALS ” PLEASE GIVE ME A CHANCE? That’s all I’m ASKING FOR “IS JUST A CHANCE TO HELP OTHERS/MY PARENTS? This is What “Thr Lord wants of me! “MY PURPOSE IN LIFE!! I FEEL IT AND KNOW IT!! But I NEED HELP, TO HELP ME HELP OTHERS !! Thanks PCH & Families (~_~) Good Luck To All ! if I’m to thank anyone it would be pch for letting me enter this $5000.00a week forever super prize. I do want to win so I’m letting Jesus Christ decide if this prize will be mine or not. once again, pch, thanks. Yes i would like to win. It will help me to better the community and my life. I DID THE SEARCH AND WIN FOR THE DRAWING TOMORROW TO WIN THE 5,000.00 A WEEK FOREVER. I HAVE TRIED VERY VERY HARD TO WIN THIS. I HOPE IT HAPPENS. I AM IN IT TO WIN IT AT PCH!!!!!!! If I won, I would no longer be debt free and it would be a life long dream. I know money can’t buy happiness, but it sure can help with stress and mental load. I want to win $5,000.00 a week for life from Pch Gwy 4900 and Pch Gwy 3080. Please help me win. Thank you. I want to win this money, simply to better my living for me and my family. And to pay someone to give a kidney to my dying father..
Hi, Thankyou PCH For The VIP List Status, Thankyou Deborah Holland, Thankyou Todd Sloane, Thankyou Dave Sayer, Thankyou Danielle Iam. Please Enter Me In Giveaway Number 3080 To Win It On February 27, 2015, The “Forever”Prize, A Fantastic Surprise. Please Also Confrim My Entry. God Bless, And Amen. I would like to win $5000.00 week because I would be able to get out of debt. It would be nice, because I am 72 years of age and am retired and on a limited income. Please lock my number in for the 5,000 forever prize. I am a single mother of five with a one year old grandson, this prize would really help me and my family with our financial ruin. Over the years I’ve watched PCH bless random people and thought to myself that something like that would never happen to me, for I very seldom win anything. I would be more than greatful if me and my kids could win this prize. Winning this $5,000.00 for life would be an Angel protecting me since my loving husband’s death, moving, selling our home & many more new life changes. Also to help our children move on. Please accept my entry for $5,000.00 for life. A cash payout for me! I just want to win ! Maybe one day! yes pch it would be awesome to be pch winner of $5,000.00 a week for life i know it’s omost the end to get entries in to win an to be a winner but i shure wish i was that winner i really do well however is the winner is one lucky person. Well tomorrow is one day from who can be the lucky winner.i sure hope it’s me because I really want to win so bad.if I can win it can help me n my family out of our financial debt n bring us so much joy to be able to pay our bills on time. I would like to win , I have been plying for years and its been a long time coming but I have keep my faith: I remember to look up into the hill where my help come from: it would be the blessing I need ! I have always help others , but trust in Jesus name !! I would get my family together and feed the home less the T bone stakes dinner !! Hello PCH. I would definately like to be the winner of the $5,000 a week forever GWY no.3080. Thank you. Hello PCH. I would definately like to be the $5,00 a week forever winner gine away no. 3080. Thank you. Hi, I Am In It To WIN It , The “Forever ” Prize. Please Enter Me In Giveaway Number 3080, For A BIG Surprise On February 27, 2015. Thankyou Deborah Holland, Thankyou Todd Sloane, Thankyou Dave Sayer, Thankyou Danielle Iam. God Bless, And Amen. PCH SuperPrize “Forever”/SweepStakes Entries! PCH – WIN $5,000.00 A Week “Forever” Plus WIN $50,000.00 Bonus Prize! PCH GWY.NO’S. 3080! 3600! D.M. Please Try To Understand Winning Could Make Or Break Me Please Choose Me TY. HELLO PCH TEAM, YES I WOULD LIKE TO WIN $7,000.00 A WEEK “FOREVER’FROM PCH GWY.NO.4900.or $5,000.00 A WEEK “FOREVER”FROM PCH GWY NO.3080,PLUS A BRAND NEW LINCOLN MKZ FROM PCH GWY.NO.4650. I HAVE BEEN PLAYING SENCE 2008,MY BROTHER TOLD ME I WILL NEVER WIN.SO COME ON DOWN TO MY HOME TO KNOCK ON MY DOOR, I WOULD LOVE TO MET ALL OF YOU.BE CAREFULL,GOD BLESS YOU ALL. February 27,2015 is Final week that I hope to win $5,000.00 A Week “Forever” Giveaway No. 3080 And Please come my House To Knock The Door. Thank You So Much PCH! And Plus Next April 30th 2015 I also Want to win $7,000.00 A Week For Life Giveaway No. 4900 I Need to Win! Thank You again PCH!!! You Are So Great And Bless God !!! PCH IM CLAIMING AND ENTERING MY ENTRIES TO.WIN $5,000.00 “FOREVER” SWEEPSTAKES, GWY NO.3080,3148,3577,4650,4651,4749,4900,5135… PKS ENTER ALL MY ENTRIES THNX PAULINE…. Hi, Please Enter Me In Giveaway Numbers 3080 I Am In It To Win It, 4950A, 4950, 4900 $ 7,000.00 a week For Life, And 4900 $ 10 Million Dollars. Also Please Confrim All Of My Entry’s. Thankyou Deborah Holland , Thankyou Todd Sloane , Thankyou Dave Sayer , Thankyou Danielle Iam . God Bless, And Amen. 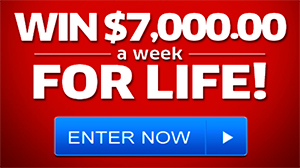 Yes, PCH Its would be Last Chance To Win $7,000.00 A Week for life Giveaway No. 4900 Or $5,000.00 A Week “Forever” Giveaway No. 3080 On February 27th. PCH Please come my home to knock the door.!! Thank You!!!!! Yesterday was a ruff day for me I had surgery on Wednesday . And had a draining tub put in and u can only sleep one way . I thank god to be a live I pray that I can win this drawing coming up in a couple of days. I really want to win it would be so nice to pay off all my financial debt. Yes, I want to be a winner, God Willing, in your big “Forever” gwy #3080, #4900 & #3577. And some others. With the Good Lords Blessings, my family thanks you, as I do, and the worthy charities I do for. Thank you PCH. Hi Please Enter Me In Giveaway Numbers 3080 To Win It. 4950A, 4950, 4900 $ 7,000.00 a week For Life, 4900 $10 Million Dollars. Please Confirm My Entry’s. God Bless, And Amen. YES PCH, I want to be your “Forever” gwy #3080 & #4900 big winner, God Willing. My family could surely use the weekly stipend as well as the worthy charities I do for. Bless you & thank you. PCH SuperPrize/SweepStakes Extra Cash Entries! PCH WIN $5,000.00 A week “Forever” Plus WIN $50,000.00 Bonus Prize! PCH GWY.NO’S. 3080! 3600! D.M. prize number procedures unique number gwy 4900 april thirty want to win. Hi, Please Enter Me In Giveaway Numbers 3080, 4950A, 4950, And 4900 $10 Million Dollars. Please Confrim My Entry’s, Please Confrim The Prize Dollar Amount, For Giveaway Number 4900, I Blieve I Have The Correct Giveaway Number? God Bless, And Amen. Please enter me in gwys 4900 & 4650. I appreciate the opportunity to participate. I hope I win this money .i really need it so I can get me home I’m homeless. Today my daughter went for a interview and u know how they work if they like what they hear or how u look u got the job . I wish I had some money I would help her out. I’m glad she want to be independent if I can win this drawing in a few days I can change everything in my life along with my financial debt. I really want to win for my kids can be happy for once it been a long time . When u get sick ur life change very different . Help me win $5,000.00 A Week “Forever” from pch gwy 3080 on February 27th 2015. Thanks. Prize Event Day is imminent I would like activate and claim to be the winner of pch #4900,on April 30 For Chance To Win $7,OOO.OO A Week for life and also For Pch #3080 on Feb:27,2015. I respond this for PCH Executives email from MS: Deborah Holland. Thank you again and wish Prize Patrol knock on my door soon. I want my dreams to come true so much and I know only happen with pch and prize patrol. You guys. Rock now come and rock Barstow come make believer out of them. Hi, Please Enter Me In Giveaway Numbers, 3080, 4950A, 4950, And 4900 $ 10 Million Dollars. Please Confrim My Entry’s, And Also Please Confrim The Prize Dollar Amount, For Giveaway Number 4900, I Believe This Is The Correct Giveaway Number. God Bless, And Amen. I’ve been a tacked by two mule deer bucks, left for dead, I was life flighted and survived ..I could use the money to get through rehab.and help out my community. One lady at dinner before I left back to job site, told me she was sent down by God as a angle lookout for life, and she was the first person on seen . Today I started to count down to see if my family life is able to change. I pray it come true boy it would be a blessing to win this draw. It would help my financial situation out a lot n I can leave a legacy behind. I would love to win $5,000 a week for life and want to retire and spend more time with my family,friends too! Mi confirmation a pch gwy no.3600 OPRTUNIDAD del bonus$5,000.00 w-08 enprize Me guitarist ganar ese premio mi mayor alegria esa es more Surrey so as I dios lo permitted. PCH SuperPrize/SweepStakes Entry! 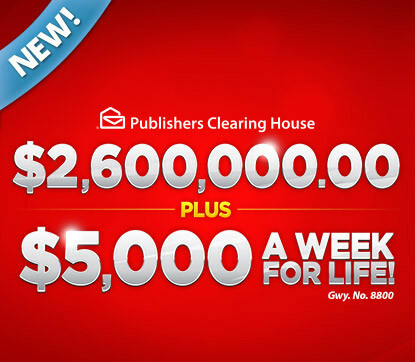 PCH WIN $5,000.00 A Week For Life Plus WIN A $25,000.00 Cash Bonus! PCH GWY.NO’S. 4900! 4902! D.M. PCH SuperPrize For Life Entries! PCH WIN $5,000.00 A Week “Forever” Plus WIN A $50,000.00 Bonus Prize! PCH GWY.NO’S. 3080! 3600! D.M. Hi my name is milagros thank to PCH for giving me the opportunity to enter in the gwy 3080 on Feb,27th. Also gwy 4900 on April 30th .wining is my goal.Iam the next WINER”!!!! Hi, Please Enter Me In Giveaway Numbers, 3080, 4950A, 4950, And 4900 $ 10 Million. Please Confrim All Of My Entry’s, And Also Please Confrim Prize Dollar Amount, For Giveaway Number 4900, That Is The Correct Giveaway Number. Thankyou, God Bless, And Amen. I would love to win 5,000 a week prize!! Please make my dream com true for my and my son!! I can’t wait for you guys coming knocking on my door on the 27th!!! PCH GWY NO.3080 $5,000.00 A WEEK “FOREVER” YES I’M STAKING MY CLAIM ON THIS $5,000.00 A WEEK “FOREVER” PRIZE! IWANT TOWIN 5,000.00 A WEEK FOREVER PCH GWY#3080 ON FEB 27,GWY#4950,GWY#4650,GWY#4651,GWY#4355,GWY#4900,GWY#3814,WITH BONUSES THANK GODAND THANK YOU PCH. I WANT TO WIN 5,000.00 A WEEK FOEVER PCH GWY#3080ON FEB 27,AISO AND BONUSES.GWY#4950,GWY#4650,GWY#451,GWY#435,GWY#4900,GWY#3814. THANK YOU PCH. I WANT TO WIN 5,000.00 A WEEK FOREVER PCH GWY# 3080 ON FEB 27 AND GWY#4950,GWY#4650,GWY#4651,GWY#4355,GWY#3814,GWY#4900. THANK GOD AND PCH. Entrando pch gwy no.3080 a week forever with 5,000.00 en feb 27 no esta nada mal Sizemore crumple con las recalls del Nuevo. HELLO PCH YES I AM VERY INTRESTED IN WINNING 5,000.00 A WEEK FOREVER PCH GWY#3080,GWY#4950,GWY#4650,GWY#4651,GWY#4355,GWY# 3814,GWY#4900 ON FEB 27 THANKGOD AND THANK YOU PCH. Reading some of the replies I can’t stop laughing. I just know Pch is coming to 257 Arbor Hills Rd N Talking Rock, GA on February 27th. Woohoo sooooooo excited. Dear pch, my family and I have been struggling for the last twelve years. I have been praying for February 27 2015 to answer my prayers. I hope that pch family select my family for the $5000 a week for life. Thank you for taking the time to read my letter. .
we desperitly need to win $5,000.00 a weekfor life thanks pch.